Whether it&apos;s a gathering of friends to watch the game or a weeknight meal for the family, this hearty sandwich is sure to satisy everyone. Preheat grill to medium high heat; grease grates well. In a small bowl, mix together mozzarella cheese and roasted peppers, and set aside. Season steaks with salt and freshly ground black pepper, if desired. Coat lightly with 1/4 cup of Pesto Sauce. Coast mushrooms lightly with remaining 1/4 cup of Pesto Sauce. Grill steaks for 4 to 7 minutes per side, or until cooked to desired doneness. Transfer to platter and keep warm. Meanwhile, grill mushrooms, rounded side up, for 4 to 5 minutes, or until lightly browned. Turn and grill additional 3 to 4 minutes. Remove from grill and spoon pasta sauce and cheese mixture into mushroom caps. Grill for another 3 to 5 minutes, or until cheese is melted. Transfer to platter. Serve immediately with grilled steaks. 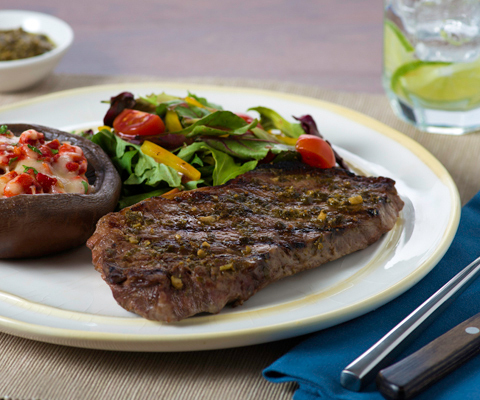 If desired, serve steaks with lemon wedges and additional Pesto Sauce. Just as delicious with rib-eye or t-bone steaks.